The Ace Brushed Steel Stool Black is a superb modern design that will look great in any modern kitchen or breakfast bar. Stylish, sturdy, and steadfast, this fixed height model has a contemporary edge that will give your interior a fresh and fashionable look. The seat is padded with high density foam and covered in black faux leather, giving both a luxury look and luxury feel, as well as high levels of comfort. The slightly curved backrest adds to this, giving good levels of support for your back and making the Ace a very relaxing place to sit. 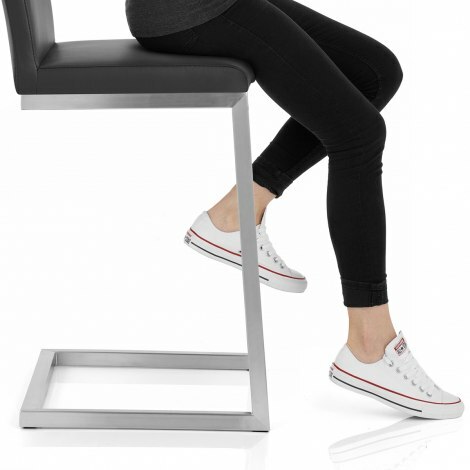 The comfortable seat is mounted on a brushed stainless steel frame of masterfully welded box-section. The frame has a bracing bar at the front that doubles as a footrest, whilst protective pads beneath help protect your floor, adding to the list of desirable qualities. "Comfortable good quality, sturdy stools"
These chairs are very attractive and fit well in my new kitchen. They are comfortable and a perfect height. The customer service and delivery were excellent. The chairs were very well packaged and quick and easy to assemble with the provided allen keys. Fully recommended. Love them, very comfy and just the right height. 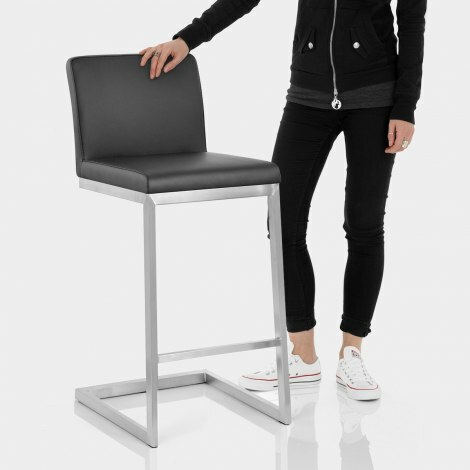 These stools are super comfy and very reasonably priced. The correspondence and delivery was first class. I would highly recommend. We spent a long time looking for the perfect height stools for our kitchen island and these were worth the wait. We also wanted a decent sized seat and a simple design that would last last. Great delivery, comfortable good quality, sturdy stools. Highly recommend.